As you drive into the northeasternmost state in the union, you start seeing lobsters everywhere. The king-sized crustaceans are harvested from the cold waters along Maine's coast, and the state is justly proud of their high epicurean quality. And in Maine, you don't have to be a gourmand to enjoy lobster; even McDonald's serves up the delicacy. You will notice lobster images on signs, pamphlets and, in particular, on the state's license plates. Beneath their lobster icon, the tags proclaim Maine to be "Vacationland." For geologists as well as lobster-lovers, nothing could be truer. Maine is a prime destination to revel in geomorphic majesty. 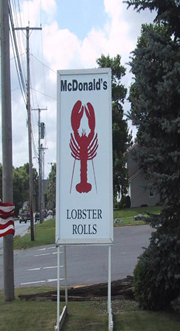 A sign outside a McDonald's restaurant in Houlton, Maine, advertises lobster rolls. Lobster is a delicious Maine specialty, and quite common in the state. Photo by Callan Bentley. Vacationland can keep you busy all summer. The cool climate and wealth of outdoor activities (both in the woods and along the shore) offer more to do than anyone could accomplish in a single visit. In the early part of the summer season, head for the coast first. That way, you will avoid the worst of the black flies in the state's interior. The first place most people head for year-round is Acadia National Park, located near Bar Harbor. The bulk of the park occupies the confusingly named Mount Desert Island, a rocky outpost of pink granite, relentlessly sculpted by both glaciers and the Atlantic's waves. Acadia hosts an excellent example of a glacial erratic, a rock transported from somewhere else: Balance Rock, an enormous boulder perched on the edge of an amazing view. Down at sea level, Thunder Hole is a cave where deep rumbles boom outward whenever waves wash in. Quoddy Head State Park, near Lubec, Maine, is the easternmost spot in the United States. It offers incredible coastal hiking opportunities. Photo by Callan Bentley. Promoters of Acadia tourism will also tell you that the summit of Cadillac Mountain is the first spot in the United States where the dawn's sunrays hit. This is only from October to early March. Most people, however, visit Maine in the summer, not the winter. So if you want to be the first person in the country to see the sunrise, you'll have to head farther north or east  during the summer, Mars Hill, in the far northern reaches of the state (between Presque Isle and Houlton), gets the sun first. And for an interim period in between these two, for most of March, and most of September, Quoddy Head State Park is the place to be. Quoddy Head has the claim to fame of being the easternmost point in the United States. 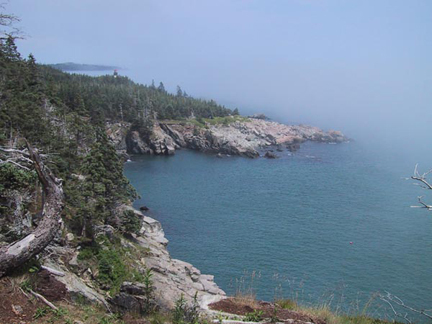 Located near Lubec, Maine, on the border with New Brunswick, Canada, Quoddy Head is a gorgeous seaside array of cliffs and forest, shrouded in fog and capped with a squat, charming lighthouse. Hiking along its coastal trail is an unqualified treat. Visitors experience the spectacular scenery, plenty of moss and birds, and the occasional foghorn wail drifting in from the lobster boats out in the bay. 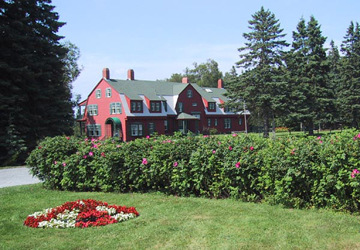 While you are there, it's a short drive across the border (demarcated by the St. Croix River) to go visit Campobello, the summer getaway of U.S. President Franklin Delano Roosevelt. FDR's palatial family home is preserved there in a unique international park run jointly by the U.S. and Canadian park services. After you've toured the house, you can peruse the area's geology using Donald Allen's (of Colby College) excellent pamphlet, "A Geological Tour of the Roosevelt Campobello International Park." Campobello is Franklin Delano Roosevelt's summer retreat, preserved as a unique international park in New Brunswick, Canada, a short distance from the Maine border. Photo by Callan Bentley. Offshore, you'll find a legendary wonder: an authentic whirlpool. Midway between Moose Island, Maine, and Deer Island, New Brunswick, lies a treacherous stretch of water, Passamaquoddy Bay (location of the Disney film Pete's Dragon). Passamaquoddy's tides are enormous, almost 30 feet. This is not surprising for what is essentially an offshoot of the Bay of Fundy, where the tide ranges have the world's record for the maximum vertical range between high and low tide. As the tide comes into Passamaquoddy Bay, it brings 40 billion cubic feet of water, which mixes with the St. Croix River's output. All this water flows in turbulent eddies as it encounters a pair of submarine trenches and an undersea mountain. At neap tides (the highest of the high), a funnel-shaped pattern develops. Heavy winds accentuate the effect, and the result is the swirling whirlpool known as the "Old Sow." The Old Sow can be a dozen feet deep, and can develop in a matter of seconds. The whirlpool, one of a handful around the globe, has claimed many ships and many lives. You can see it from the shore, or you can charter a boat to go attempt a closer visit. Just don't go too close! Finish up your stay in Maine by heading into the woods. Fill up on gas and groceries before you go, because the northern two-thirds of the state are in essence privately owned wilderness. The area is known as North Maine Woods. Great rivers like the Allagash and the St. John thread their way north through forested landscapes, all owned by paper and timber companies. These companies maintain a sparse network of dirt roads, and, thankfully, they do allow visitors. Moose and bears will be more common companions here than other people. It is a truly wild place. Opportunities for fishing, canoeing, kayaking and camping abound. Rigorously qualified "Maine Guides" can be hired to lead excursions in the activity your choice. 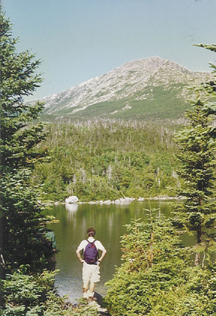 Located in Baxter State Park, Mountain Katahdin looms above a hiker. The mountain's granite summit is the highest point in Maine, and the northern end of the Appalachian Trail. Photo by Ronald Bentley. In the middle of the North Maine Woods, a great mountain rises above the trees. A chunk of granite 5,267 feet tall (the highest peak in the state), Mount Katahdin is both the northern terminus of the Appalachian Trail and a terrific day's climb. The mountain is situated in Baxter State Park, well off the beaten track. In the words of former Maine Gov. Percival Baxter, who donated the land for the park, it is "for those who love nature and are willing to walk and make an effort to get close to nature." Don't expect a mere drive through the park in Baxter. When you arrive, your car will be dusty from the hundreds of miles of dirt road. Park it and set off on foot. Then you can ascend the mountain itself, detouring around the glacial tarn that is Chimney Pond, and summiting via a long arête appropriately called "The Knife Edge." Henry David Thoreau climbed Katahdin once and was terrified by the experience. He knew the mountain by a more sinister spelling, "Ktaadn," and described its summit as one of the "unfinished parts of the globe." While Thoreau came away from Katahdin shaken to his core, it is more likely that modern visitors will leave satisfied, tired, and with a healthy appetite. Time for some well-earned lobster!